These Crock Pot Chicken Ranch Tacos have become a regular in our house recently. Basically, I’ve just been too busy to cook much and it’s too hot to stand over a sizzling skillet. So I toss a few ingredients in my slow cooker when the kids go down for a nap, and then later that evening I have moist and yummy chicken tacos that are smothered in a delicious ranch/taco sauce. Add it to some taco shells with the fixings and voila! What an amazing an easy way to make chicken tacos for dinner. And for such little effort, I get a low calorie meal and my family gets a tasty dish they enjoy. This is also a great Weight Watchers Crock Pot Recipe for potlucks or parties. It’s so easy, and so good! 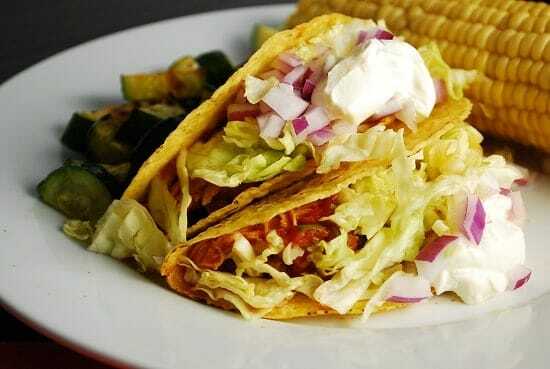 This easy Crock Pot Tacos Recipe is sure to be a hit. Juicy, tender chicken that has been slow cooked in the most deliciously seasoned broth, then served in a crunchy taco shell with all the traditional fixings. Put chicken, broth, taco seasoning and ranch seasoning into a crock pot and cook on low for 4-6 hours. Divide chicken and taco fixings evenly amongst the taco shells. These are probably the best chicken taco my family has ever had. My kids even ate them without complaining. (Which is huge!!) Thank you!! Can you advise how to make the taco / ranch sauce? What kind of shells should I use? I just used the standard, store-brand crunchy tortilla taco shells. The store bought shells are 3points each which are 6 points in total so the receipt must be more points. Can you please explain your calculations? The calculations I entered were the nutritional stats for each ingredient that I used. I’m guessing that the biggest variations are on the brand of taco shells and the brand of chicken. I used Trader Joe’s Organic Chicken breasts and I think I used Trader Joe’s Taco shells for this recipe too. These shells are 3 Points + for two taco shells. Make sure to check the packaging on yours…it might say that 1 serving is 2 shells. I made this tonight and the flavor was amazing. I found the chicken mixture had too much liquid. Should I have drained the liquid before spreading the chicken? You can drain it, if you’d like. Chicken breasts can vary in how much water they retain, so this may sometimes happen. I also use half a packet of each the ranch and taco seasoning. Tasty and not salty. This has easily become one of my go to recipes! My husband loves it and even my picky daugther will eat it! I have used the left over chicken to make a taco soup! Yummy! I just put the left over chicken in the crock pot with chicken broth, black beans, corn and some more taco and ranch seasoning. Topped with some ww cheese yummy! how long if I do it on high? This recipe is low salt and makes about the amoun in one envelope of purchased type. Made this tonight and loved it! Tho I found adding tomato paste made it a bit tastier, and next time I’ll only do half the water. My husband and I thought the chicken was way too salty! I rinsed the chicken this morning and now looking for another recipe to use it in. Any ideas? Made these & will make again, over & over. Not only were they very easy to make, my whole family loved them. Everything I have made from this site & from Skinny Taste, we loved. I use the recipe box to create a weekly meal plan and then print out the list for shopping. So easy to stay on track & eat good food. I just made these and they are delicious! I normally don’t eat any mexican food (or anything, for that matter) without cheese but this chicken was so good I didn’t even miss it. Great recipe. Definitely delicious! All I heard from my fiance was “mmmmmmmmmmm”! I agree though, a bit too salty for my taste. From now on I will make my own taco seasoning instead of buying the packets. These were good, but I found them to be a little too salty. I will definitely make again with the low sodium taco seasoning and low sodium broth. Thanks for the recipe! I had some chicken that I needed to cook, so I tried this recipe, not expecting much. BOY WAS I WRONG!!!! This made the BEST flavored chicken ever!!! I never did make tacos with it. I ate it straight up. And it’s delicious cold, too! Made this for dinner last night and leftovers again today for lunch. This was excellent. Very tasty and everyone loved it. Can this hang out in the crock pot for several hours beyond 4-6? I would be turning it on as I left for work in the hour, probably 10 hours before dinner time. I think it should be fine. Haven’t tried it myself, but given that it’s just meat, it shouldn’t be a problem. When I have to cook it all day I usually put the chicken in frozen. It’s perfectly done when I get home from work. Oh my goodness. Those were some of the best tacos I have ever had! Thank you for sharing. do the points include the taco shells? It must because there is no way a little bit of chicken with just the seasonings is 6 pts. Plus it says:Divide chicken and taco fixings evenly amongst the taco shells. Printed out the recipe to make this weekend!